1) Click on 'Profile' above. 6) Add your personal smiley links (they must be hosted, so use Photobucket, Imgur, or whatever you like). 9) Now you're done. 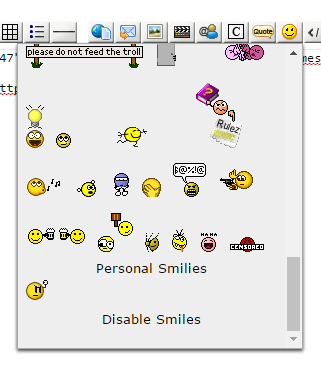 Whenever you want to use them, just click on the smiley icon and they will appear at the bottom of the list.